I know that I must sound like a broken record when it comes to my #WeekdaySupper posts. Simple, real food is the best food. Especially when you're in a hurry. Of course, I also talk about preparation, but today's meal can be made without advance preparation and still be on the table in far less than 30 minutes. I always have pasta in my pantry and eggs in the fridge. With the addition of only a few simple veggies, herbs, spices, and some oil, I've always got a great meal. I recently bought a pound and a half of black garlic. That's a lot, by the way. So, I've been using it like crazy. 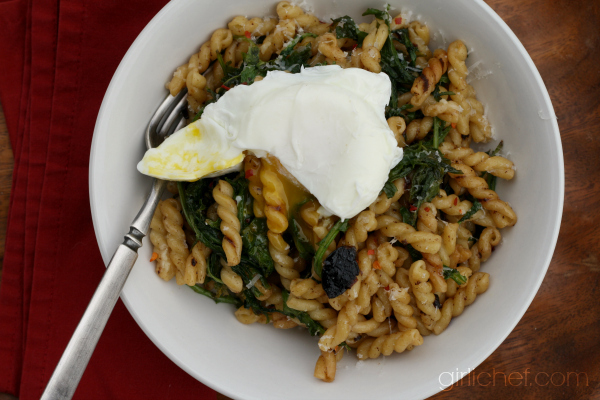 Sliced very thin, and tossed sauteed with a bit of oil, a few red chile flakes, and a huge handful of baby kale, it made the perfect flavor-packed, yet super simple meal when added to some pasta. But the pièce de résistance? 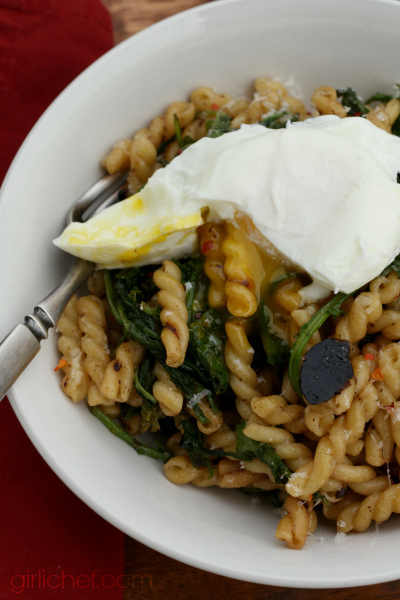 An egg that has been poached lightly and then perched on top, so that when punctured, the golden yolk oozes out and coats the pasta with its richness. Parmesan. BOOM. That's what I call a Weekday Supper. 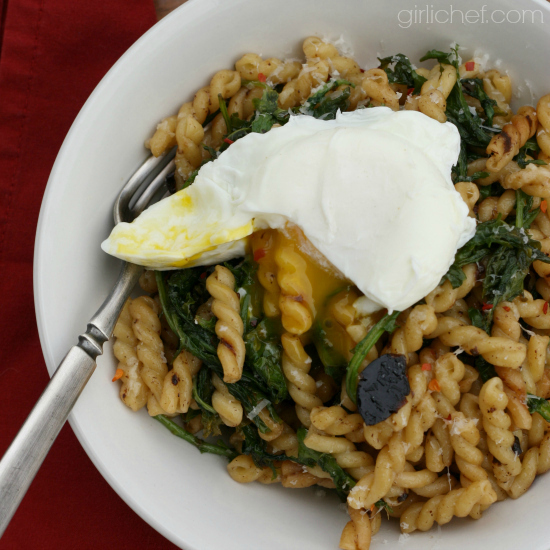 For a meal that can be put together so quickly, this pasta packs a huge hit of flavor. Bring a pot of salted water to a boil; cook pasta until al dente, according to package instructions. Once the pasta has been boiling for half of the time it needs, heat the olive oil in a deep-sided nonstick skillet over medium heat. Add garlic and saute for a minute or so. Toss in kale and crushed red chile flakes and cook until just wilted, 1-2 minutes. At this point the pasta should be about done. Using a strainer or large pasta scooper, lift the pasta out of the water and into the skillet. Toss everything together, then add salt and pepper to taste. Lower the pasta cooking water until it's barely bubbling. Crack the eggs into small individual bowls. Gently lower into the water and allow to poach, 2-3 minutes. 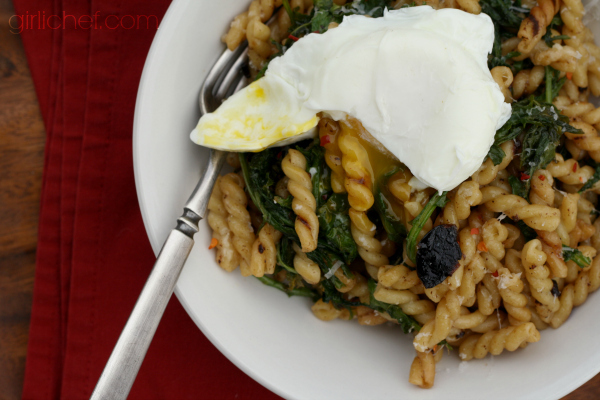 Transfer the pasta to serving plates, then top with poached eggs. Grate some Parmesan over the top and enjoy!